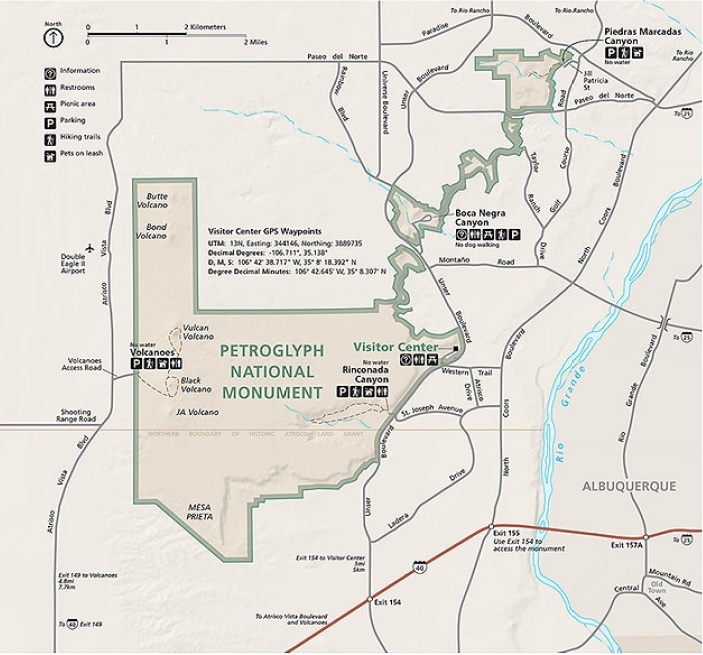 The Rinconada Canyon trail is located in Petroglyph National Monument near Albuquerque, New Mexico. There are said to be around 1,200 petroglyphs in Rinconada Canyon that were made by the Ancestral Puebloan people 400 to 600 years ago. The Rinconada Canyon trail provides a closeup view of some of them as it loops around the base of the escarpment. The trailhead is just off of Unser Blvd., at the end of St. Josephs Ave., about 1 mile south of the Visitor Center. Dogs on a leash are welcome in the Rinconada Canyon Unit although a sign warns that the area is monitored. There is also a sign that mentions that the parking lot is closed and locked at 5 p.m.
As the sandy trail heads into the canyon it travels about 500 feet before splitting and beginning a loop. The first few sets of petroglyphs are far off the trail and require good eyes to spot. For a better look at them a pair of binoculars would prove useful. Rinconada Canyon is entirely void of trees so as you hike you will be fully exposed to the sun and the elements. 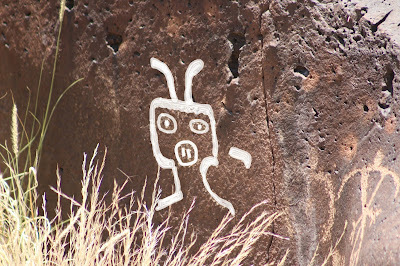 After the first half mile or so the petroglyphs start becoming more frequent and as you progress many of them get closer and closer to the trail. Several Spanish crosses decorate a boulder at a site where there is also a rock shelter that sits up away from the trail on higher ground. This image that makes use of cavities in the rock for the eyes and mouth has an eerie look to it. Teeth seem to be emphasized in a lot of the images. They also went to the trouble of showing the rattles for some of the snake images. We outlined this one on the computer to make it stand out. 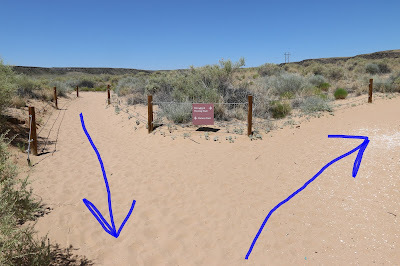 As the trail loops back to the parking lot it cuts across the middle of the canyon where there are no petroglyphs to see. In doing so it is almost a quarter mile shorter than the trip out. To take good pictures you will want to bring a polarizing filter to cut down on the glare coming off of the boulders. 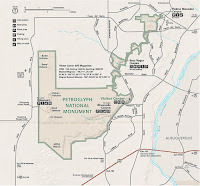 A cloudy day or late afternoon visit might also be helpful although you can't come to late in the afternoon with the gate being locked at 5 p.m. Rinconada Canyon required a lot more hiking than some of the other trails but we felt it was well worth it to see the petroglyphs there. If you would like to see it for yourself then all you have to do is 'Take a hike'.